A swimming pool provides a great way to relax and stay cool on hot summer days. It’s a luxury feature that most northern New Jersey homeowners would love to have in the backyard. In Hollywood, where celebrities are surrounded by glitz and glamour, a swimming pool is just part of the everyday lifestyle. Take a look at some spectacular celebrity swimming pool designs that will make you want to go for a swim. Cher is well-known for her flamboyant style that made her a household name. The style of her Malibu home is nothing but spectacular. Inspired by her love for Moroccan architecture, this 13,000-square-foot home features an infinity pool located on the top of a bluff overlooking the Pacific Ocean. It appears to connect to the ocean with an expansive view of endless water. The pool is surrounded by limestone columns and arched terraces that open to the main house and guest house. With this amazing view and architecture, the setting feels more like an Italian Villa on the Amalfi coast instead of sunny California. John Travolta owns several homes, but he lives in his Ocala, Florida home. It’s a masterpiece of modern mid-century architecture with flowing curves, lots of glass and a private runway for his two airplanes housed on the property. The swimming pool is designed with a geometric shape that complements the home’s architecture. It’s situated at the rear of the house surrounded by palm trees and a 707 in the background. The pool has a jacuzzi at one end, a fun water slide and temperature controls. It’s surrounded by travertine that’s cut in irregular shapes and sizes to accent the lines and angles on the house. This beautiful Mediterranean-style home is located in Mullholland Estates, an affluent, gate-guarded community in Beverly Hills. The sprawling property contains a gorgeous custom built pool in a classic rectangular shape that’s simple and elegant. It’s surrounded by green grass and large travertine pavers that reflect a sophisticated style. The exterior lighting around the house and pool area provide a soft romantic setting for evening swims. Ben Stiller’s Hollywood Hills home offers picturesque views of Los Angeles. The Mediterranean-style architecture in white stucco with a terra-cotta tile roof sits on a hilly landscape with different terraces in the backyard. The swimming pool sits on the lowest terrace level surrounded by yucca palms, banana trees and tropical plants that provide seclusion. The pool is a rectangular-shaped design bordered by beautiful terra-cotta and mosaic tiles. A cabana at one end of the pool with comfortable seating and a bar provides a quiet place to relax. The Beverly Hills estate of Ellen Degeneres and Portia de Rossi reflects classic California-style architecture in a peaceful green setting. The property is very private surrounded by shrubs and trees on three sides, but the pool has an incredible view of the city and the Pacific Ocean. The traditional rectangular-shaped pool is bordered by beautiful Brazilian granite coping with three seating ledges. The pool is simple and blends quietly into the relaxed atmosphere of the landscape. This beautiful 8,500 square-foot Bel Air home belongs to actress, Jennifer Aniston. The property includes a vineyard, wine cellar, outdoor kitchen and gorgeous terraced pool. The home’s mid-century architecture with straight lines and cantilevered overhangs are reflected in the pool’s design. To emphasize the hard surfaces and clean feel of the house, the pool is surrounded by scored concrete that’s cut in large rectangular shapes. The overall mood is simple, yet sophisticated. Rob Lowe’s Georgian-style home, located in Santa Barbara, CA., is about an hour north of Los Angeles. This custom built home contains 20 rooms in the main house, a guest house, pool house and lovely pool situated on a four-acre property. The large pool that includes a jacuzzi, fountains and seating areas is a classic rectangular shape bordered by natural stone pavers. Traditional swimming pool designs surrounded by lush green landscapes always create a setting that’s elegant and sophisticated. Sylvester Stallone’s 14-acre home in Miami, Florida features a spectacular pool with a life size bronze sculpture of Rocky Balboa. The pool is surrounded by trees, shrubs and plants that provide almost complete privacy for swimmers. The classic rectangular-shaped pool is surrounded by elegant travertine walkways, seating areas and classic finials at one end. Cobalt blue tiles are used on the pool steps and as accents around the interior. It’s definitely a classic and elegant look. The home’s contemporary architecture is reflected by the use of natural materials and straight lines that are repeated in the design of the pool. A very large pool that sits at the rear of the house is accessed by expansive openings in walls of glass. It is surrounded by cedar decking and lush palm trees accented with exterior lighting. The pool deck area includes a hot tub and seating area for guests to relax and take in the serene view and clear night skies in California. Home for Lance Armstrong, the seven-time Tour De France champion, is in Austin, Texas. The contemporary house, overlooking Lake Austin, contains an indoor sports court, art studio and media room. The L-shaped pool is located on one side of the house in a quiet, peaceful setting. It’s surrounded by stone pavers that reflect the architectural details of the house. The pool and property connect to a boathouse on the lake by an incredible 200-foot suspension bridge. Actress, Ellen Pompeo is best known for her work on the TV series, Gray’s Anatomy. Her home is a 1920’s Spanish-style bungalow in the Hollywood Hills. The property is hilly with terraced gardens surrounded by tall cypress trees for privacy. The classic-style swimming pool is simple and elegant. It’s located in a level terraced area surrounded by lush green grass. The pool is bordered by a simple concrete ledge accented by furniture on the lawn. Fashion designer, Ralph Lauren, owes several homes but spends most of his time at this 16,000-acre ranch in Montauk, Colorado. It’s a rustic setting that includes a main house, several guest houses, horse stable, huge barn and a gorgeous swimming pool. The pool is situated close to the main house and guest houses with a 360 degree view of the open spaces. With its natural rock ledge and perimeter fence, it blends into the landscape with ease. This is truly the perfect place to relax and enjoy nature. Ralph Lauren’s home in Jamaica is a big contrast to the Colorado home, but just as beautiful. It’s contemporary design and location takes full advantage of magnificent ocean views. The pool is actually built into the cliffs above the ocean. Several terraces cantilever at different levels down the slope to create swimming and seating areas with a full view of the ocean just below. What an incredible setting this is! Lauren’s Bedford, New York residence captures a more traditional lifestyle. Surrounded by tall pine trees, this lovely setting shows the pool and pool house. The Grecian-shaped pool features steps at one end and a jacuzzi/hot tub at the other. Surrounded by light, natural stone pavers and green grass, this setting is a beautiful example of swimming pool designs that reflect traditional elegance. 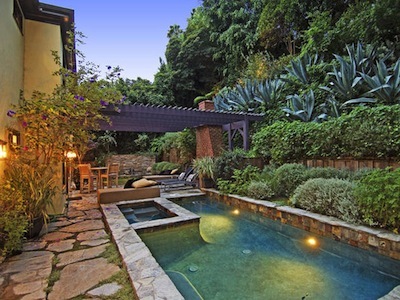 Channing Tatum, a rising Hollywood star, has a modest 2,600 square-foot home with wraparound terraces, floor-to-ceiling windows and a secluded back yard that houses a gorgeous free-form swimming pool. Lush greenery and quiet waterfalls make you feel like you’re somewhere in Bali instead of Laurel Canyon. The pool with it’s soft curves and cantilevered ledges is surrounded by natural blue slate walls and decks that create a peaceful, relaxed setting. Well-known fashion designer, Cynthia Rowley, has created many Oscar gowns for the red carpet. Her career keeps her based in New York where she resides in a Manhattan townhouse with limited space for a swimming pool, so she’s built a long lap pool that’s great for exercise. These swimming pool designs are great for small properties. Complete with lounge furniture in stylish fabrics, a swing and a wall of privacy this pool is perfect for urban living. Model, Cindy Crawford, lives in an oceanfront Malibu home perched high above the beach. With spectacular ocean views, the infinity pool creates an illusion of endless ocean just out the back door. Natural stone surrounds the pool and terraced levels that continue down the hillside. Palm trees and shrubs divide the property from neighbors and create a natural environment for the pool. Fashion designer to the stars, Roberto Cavalli, is famous for his bold animal prints. Home is a Tuscan estate near Florence, Italy with a warm climate and sunny skies. Cavalli decided to build his long rectangular pool inside instead of outdoors. The pool is wrapped in stone with bull nose edging and stone pavers on the decking area. With overhead skylights and easy access to the back yard through large sliders, this pool is great for laps and relaxing. Jamie Lee Curtis lives in a Los Angeles 1920s Spanish Colonial house surrounded by lots of trees that provide privacy for the grounds and pool. The pool is a classic rectangular shape bordered in natural stone. There is an adjacent whirlpool and sauna just steps from the pool. Simple swimming pool designs, like this one, blend effortlessly into the surroundings and let the landscape become the main interest. An actress from the 1940s, Jayne Mansfield was known as Hollywood’s “blonde bombshell.” Her Beverly Hills home is famous for the heart-shaped pool that intrigued the Hollywood set. Her husband, Mickey Hargitay, had the pool custom built for her with a special inscription written on the pool bottom that said “ I Love You Jayne.” Swimming pool designs like this are not seen much today, but they certainly get your attention. Adam Levine, lead singer for Maroon 5, has a 1940’s home in Beverly Hills. Situated on 3.6 acres, the 6,500 square-foot home has 6 bedrooms, 7 bathrooms and a beautiful swimming pool situated on the rear of the property. The pool design is simple with terra-cotta pavers and blue tiles under the ledge. A round jacuzzi sits at the curved end of the pool. This infinity edge pool is the perfect pool design for this mid-century home nestled high in the Hollywood Hills. The pool and home have a complete view of Los Angeles and the bright city lights that shine over the edge. The pool creates a cosmopolitan ambiance that’s tranquil and relaxing. Infinity edge swimming pool designs built on a cliff create spectacular visual effects. French fashion designer, Christian Audigier, is famous for his trendy Ed Hardy clothing line. His Los Angeles home includes custom swimming pool designs that feature two over-sized cabanas, an outdoor kitchen and a 20-foot hotel-caliber bar for guests. The pool is a traditional rectangular shape with stone accents and pavers. Cobalt blue tiles on the bottom of the pool accent stunning color. Better known for his role as Larry the Cable Guy, Dan Whitney resides in Sanford, Florida. He has a beautiful lagoon-style pool that includes a waterfall, grotto, spa and outdoor television. Adjacent to the pool is a movie theater, sunning beach and outdoor kitchen area. The free-form shape and use of natural stone emphasizes the natural environment. This home belonged to Arnold Schwarzenegger and Maria Shriver. Located in Beverly Hills, this geometric pool has a waterfall that flows constantly into the pool. It’s enclosed by multi-level travertine patios and terraces, swimming pool designs that give the pool lots of needed privacy in a suburban setting. Ashton Kutcher’s contemporary home has a very private back yard with concrete decks, stone pavers and multiple levels. The focal point is a three-tiered cascading waterway. The water flows from the raised circular spa to the infinity pool, then spills over into a lighted waterfall that can be seen from inside the house. It’s a beautiful use of water features and swimming pool designs for a contemporary house. Dwayne Johnson, known as “The Rock” in Hollywood, has a beautiful contemporary home in Los Angeles with a great infinity pool that sits in a terraced back yard. There’s no ocean view in this area, but plenty of rolling hills and trees to create a tranquil retreat for swimming. Just past the gated driveway, there’s a gorgeous stacked stone waterfall. Hillary Duff, of Disney fame, has a beautiful traditional home with a classic rectangular-shaped pool. The pool is surrounded by concrete decks and bordered with brick pavers for a classic feel. Bright blue tiles with white tile accents create color under the edge of the pool. Pool lighting creates a soft ambiance for night time swimming, a nice feature for swimming pool designs. Wrestler Hulk Hogan’s Florida retreat is situated on two acres that adjoin an Intercoastal Waterway. The free-form pool has two separate tiers for swimming and relaxing and waterfalls in several areas. It’s surrounded by lovely flagstone terraces and pathways that lead to an inlet and adjacent area that houses two boats and an outdoor kitchen. Frankie Muniz, known for his role on Malcolm in the Middle, has a wonderful Beverly Hills home with secluded surroundings. This inviting illuminated pool is bordered with natural stone. Stone patios are laid with stones cut in free-form shapes and sizes to create a more natural look in the area. Tiered levels of plants create a lush private setting around the pool. Britney Spears’ Malibu home has a free-form pool that’s perfect for pool parties and entertaining friends and family. The pool features a natural rock waterfall, a slide, a grotto and a toddler wading area for the kids. Natural stone pavers help to create a casual look for swimming pool designs with a natural landscape. Known as one of the singers in the boy band, “N Sync,” Joey Fatone’s home in Orlando, Florida is more like a tropical resort. This incredible free-form pool features an air-conditioned grotto with a sushi bar, waterfalls and a heated spa. A cave-like alcove made of natural rock houses an outdoor kitchen and links to tumbled travertine terraces by a bridge that spans the pool. Swimming pool designs that have various water features always create a pool environment that’s great for entertaining. Comedian and actor, Robin Williams, has a classic Italian-style villa located on six acres in Napa Valley, California, an area known for its large concentration of California wineries. The rear of this beautiful home opens to a European stone deck and gorgeous rectangular-shaped infinity pool and spa. There are adjacent sculpture gardens done in terraced levels that overlook wonderful vineyards below. Mark Wahlberg’s lavish Beverly Hills estate contains two acres of lush landscaping that’s full of palm trees and a free-form swimming pool. The pool features waterfalls, a grotto and three cabana areas. It’s surrounded by a natural rock wall and a real sand beach complete with lawn chairs. The picturesque setting of natural swimming pool designs resembles a tropical oasis. This beautiful property belongs to popular singer and recording artist, Rhianna. The contemporary home with 7 bedrooms and 9 bathrooms has a spectacular swimming pool with a private guest house. The over-sized rectangular pool is surrounded by a spacious deck in scored concrete that’s been tinted a soft terra-cotta color to match the facade of the house. A jacuzzi, done in white mosaic tiles, sits at one end of the pool and provides a nice contrast to the surrounding earth tones. The pool features underwater lights and illuminated deck jets that spray an arc of soft white water across the pool when turned on. This is the perfect setting to sit and watch the sun rise.